Since this travelogue turned out to be much longer than I intended, I plan to publish it in two parts. During our usual tea break at office, my colleagues and I came to the consensus that it was time for another trip. The Kaiga memories still haunted us, we still joked about them during our free time and laughed at it but at the same time it was time to experience new things, new fun and adventures. So not wasting any time, I started off with help of my friends, planning a trip to Coorg, a place unanimously chosen; what could be more relaxing in midsummer than going to a hill station? With our past experience with Kaiga trip, I had learnt one thing that when we travel in such big groups, we need better planning. In spite of me being a person enjoying unplanned trips to unknown lands that involve more adventure had to abide to the new rule that a trip with big group needed at least some planning. So we got on to the planning part. We booked a Tempo Traveler for 12 of us traveling, 3 rooms at a hotel in Madikeri and a detailed plan on the places to visit with timings. On the 25th day of May, 12 of us set off on this tour to the one of most beautiful hill station in India also referred as Scotland of India. 250 km drive from Bangalore is not an easy drive. In spite of leaving office at 3:30PM, we took about 1.5 hours to exit city limits. But we got on track once we hit Mysore road. A deviation to Hunsur and then a stop for dinner at Kushalnagar followed by an hour’s drive brought us to the city of Madikeri. At 12:30 AM we were at the hotel shouting and waking up people around. Of course one cannot expect a pin drop silence from a band of 12 boys. We also got some firing from an old lady in the neighboring room. Hotel Brahamagiri accepts telephone booking and it cost us 700 per room per day. The weekend was crowded with tourists and we had finalized on this after trying 10 other hotels that had absolutely no rooms free even a week before in advance. So if you plan to visit Coorg, make your bookings well in advance. When the alarm rings at 4:00 am when you have gone to bed only at 1:00 am, it’s not always a good feeling but with the spirit of adventure, such emotions seem trivial. My friend and I took the pain job of waking up guys in other rooms and preparing them to be ready and wake up the next guy. As per the plan we had to be ready by 6:00 AM. I call it a pain job, because one has to deal with interruption of another person’s sleep; which is not always polite. One has to say firm “No” to a call for bed teas at 4:00 AM and statements like “I can’t take bath without hot water.” And “Let me sleep a little more.” :-)So after dealing with all that, we were ready to leave to Tala Cauvery by 6:30 Am only half an hour late than planned which still sounds like perfect timing. The route from city to Tala Cauvery is amazing, at the early hour of dawn, the site of clouds kissing the mountains calls for a stopover and some photographs. One does not want to just keep driving but wishes to stop for a while and experience the reaction that happens there. One some way or the other wishes to be a part of all that; the mist; the cold breeze; the mountains; the trees; the flowers and all that happens between them. We reached Bhagamandala after an hour’s drive and had a good breakfast there. The hotel is run by Mangaloreans so I got to speak a little Tulu there (The local language of Mangalore). We then drove up to Tala Cauvery. The cloud had covered the entire place. The river Cauvery originates here. The temple and the surrounding places are being re-constructed and I must say that it’s adding further beauty to the place. It was the best possible weekend getaway, we could have expected; to be on top of a hill, which has just turned more graceful by touch of the mist. The silently moving cloud hit us and turned into water droplets on our body only to make us aware of the temperature difference and that is when I relized that we were obstructing the flow of nature, we were uninvited here. But man’s mind haunts to view every such game of nature; invited or uninvited, intentionally or unintentionally he wishes to interrupt the natural process of nature. A set of steps take us up a small hill, the view from where is amazing but we could only see mist and more mist. We took an off track to the top, as suggested by some tourists returning back and that turned out to be even more exciting. On our way back down the hill, we stopped at a shop that sells honey and spices that are grown there. The shop owner, again a Mangalorean, suggested that we climb up the terrace to get a spectacular view. Thanks to him for the advice, we caught some amazing glimpse of the mountains. He also allowed to us roam around his coffee estate. Our next stop was Bhagamandala, which is a sangama of three rivers; Cauvery and it’s too tributaries. River Cauvery is also called as Southern Ganga, one can wash their sins away by taking a dip in the river, they say. Not sure of sins, but I am sure such beliefs can gear up your self confidence. Somehow I feel that these rituals and rites are a form of making a person much stronger from inside yet maintain his human delicacy. The temple here again is under construction. A temple at the foot hills of sky kissing mountains can only make the place more divine and serene. Somehow a temple or any prayer places; a monastery, church or a mosque for that matter appears to be the only thing that goes well with nature and looks like a part of it, blending with its harmony. There wasn’t much water up there but luckily it had rained heavily a few weeks back, the pre-monsoon shower had converted the place into a green delight. The best time, they say to be there is July-Nov.
After spending sometime at the falls, disappointed a little that we could not drench ourselves in the water, we take a city tour. A toy train ride near Raja seat, a hike down the hills near Raja seat, an amazing evening view of Coorg from the raja seat made a perfect replacement to the water fall disappointment. 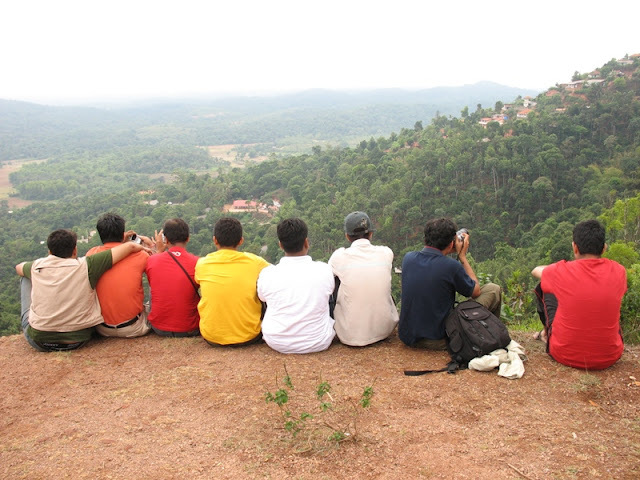 Raja seat is the place where the king of Madikeri used to spend his evenings looking down at his beautiful empire. A walk around the fort and a view from there at the prison below is a nice away to spend the evening. 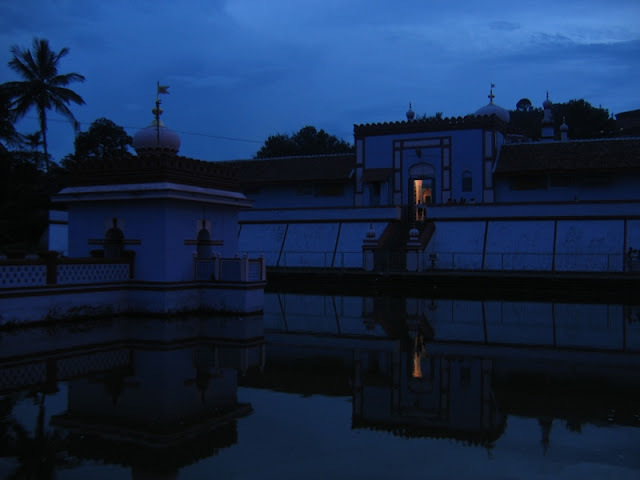 A walk by the lake at Omkareshwara temple and experiencing a very serene atmosphere at the temple could have been the only best way to wind up the days adventure in a peacfull manner. 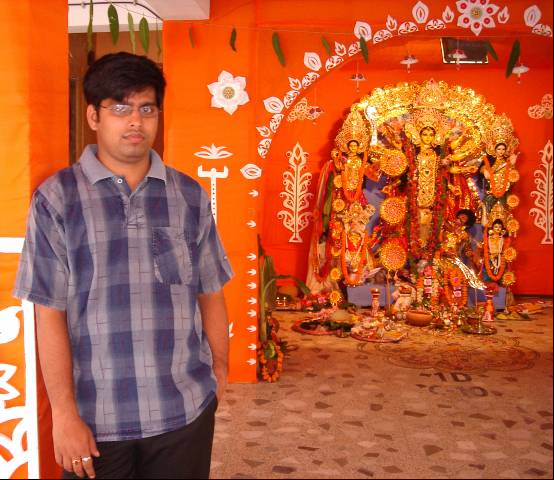 The temple is a must see place, since it has a very distinct architecture, rarely found in any other temples. It has an Islamic touch to it, appears more like a mosque at the first glance. Another just attached one chair to another and slept off after the tired day. One of my friends Kavlz and I decided to go down and talk to the management. The first talk was polite and I guess thus did not help. After waiting till about 11:30 we all went down and had a big fight with the careless, ignorant management who had kept us waiting for food for almost more than 2 hours. Thanks to Kavlz for leading the group in our fight against the irresponsible management at Hotel Spice, In the next 10 minutes we had all that was in the kitchen. A quick supply of food later, made all of us cheer loudly, even the guys on next table cheered with us. Pictures are very beautiful ..always wanted to go there , but could nt ... Ur post will be a good guide when I go ...:) waiting for the next episode ..
@Raghu Ram - Thanks....Do I know ou personally? @ Reborn - Thanks....Yep....You should be. So havent seen any new post from your side...waiting for that. Some very very well captured shots & it was nice reading your experiences. the waterfall and mountain are sooo very beautiful!! why the management was soo rude??? Great Blog.Whatever you explained in the blog was what we really experienced. Yes, it was an awesome experience and i was dumbstruck with the beauty of Coorg. I just wanted to add a comment here. It was one of the trip where the camaraderie of such a big group was out of ordinary. We were able to visit all the places as per our schedule jotted down earlier without sacrificing even a minute amount of enjoyment. I would call this trip as one of the most memorable experience. Kudos for the entire team. We definitely need to plan for these kind of trips once in at most three months. Pictures are awesome. Feels like in heaven. The clouds coming down to touch you. The wonderful waterfalls. And to top it all, your detailed description. Oh I am nostalgic now. Noted. Will contact you once I plan to go there. @Kalyan - Thanks, Found the same with your blogs too. Will comeback after a vacation to read more. @Niki Sato - They were stressed due to the crowd but ignoring a customer was not an appropriate thing they did. @Sundar - Yes indeed. The team worked very well. Everybody had the same enthusiasm. Yes should plana trip at least once in 3 months from work. @Cuckoo - Thanks.....Yep sure you should contact me if you plan to travel there. Infact now is the best time. Also you can plan hikes up the mountains and village stay. Will return from vacation to read more from your blog. U ought to seriously consider writing a travelogue!! Did u visit Byle Kuppe?? @Pijush - Thanks, Hope your trip back was safe. Lovely log Ajeya. And I remember your Kaiga trip so well!